If you are recruiting software engineers in the US and feel like you are in a crazy competitive field, well, you are right. 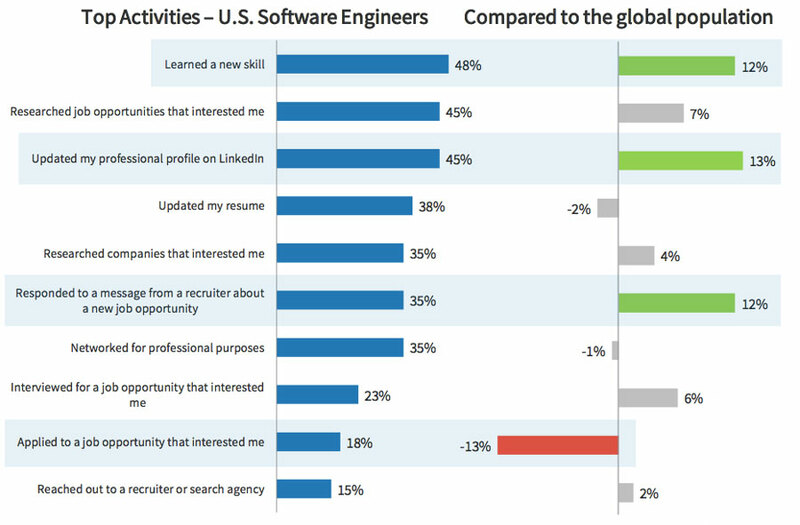 Looking at LinkedIn data, software engineers are one of the most sought-after talent pools, with the average engineer receiving 3X as much recruiter interest on LinkedIn as the average member. They’re also 13% less likely to apply for a job compared to everyone else. However, the good news is that software engineers are quite open to new opportunities and they are willing to hear you out. There are millions of them on LinkedIn in the US and they’re 12% more likely to respond to a recruiter about a new job opportunity, compared to the average professional. In fact, about ¼ of these engineers changed jobs in the past two years, often taking considerable pay bumps when they moved to a new organization. 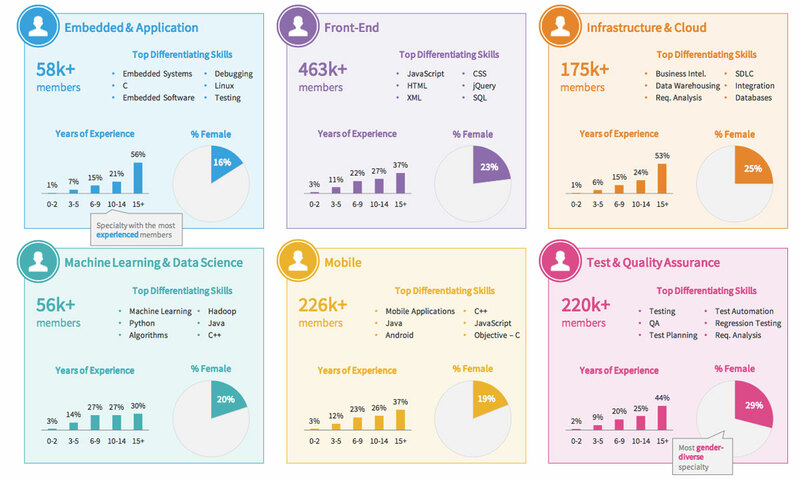 To help make your job a bit easier and give you insider knowledge on how to engage software engineers on LinkedIn, we analyzed profile, engagement, survey, and labor market data and came up with 7 data points that will give you an edge. Embedded and application engineers is one of the smallest talent pools, but it’s also the most experienced, with the largest percent of professionals boasting more than 15 years on the job. Notably, it’s also the least gender-diverse. Front-end engineers are by far the biggest talent pool: their population is more than double that of the second-biggest speciality. Engineers specializing in infrastructure and cloud computing also tend to be more experienced. Like embedded and application engineers, 77% of infrastructure and cloud professionals have more than 10 years of experience. Machine learning and data science engineers are the smallest specialty—they’re also the most in-demand (more on that in the next section), so these engineers may be particularly difficult to hire. Mobile engineers are the second biggest speciality, and they’re also one of the youngest cohorts: 38% of these engineers have less than 10 years of experience, more than any other specialty other than machine learning. 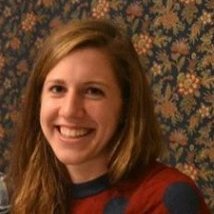 Test and quality assurance engineers are the relatively most gender-diverse group -- however, even there women represent only around 30% of its talent pool. It’s worth noting that based on this demographic data all subspecialties have a long way to go until they reach gender parity. And while the average software engineer already gets a lot of attention from recruiters, certain specialties and skillsets tend to draw even higher outreach volume. 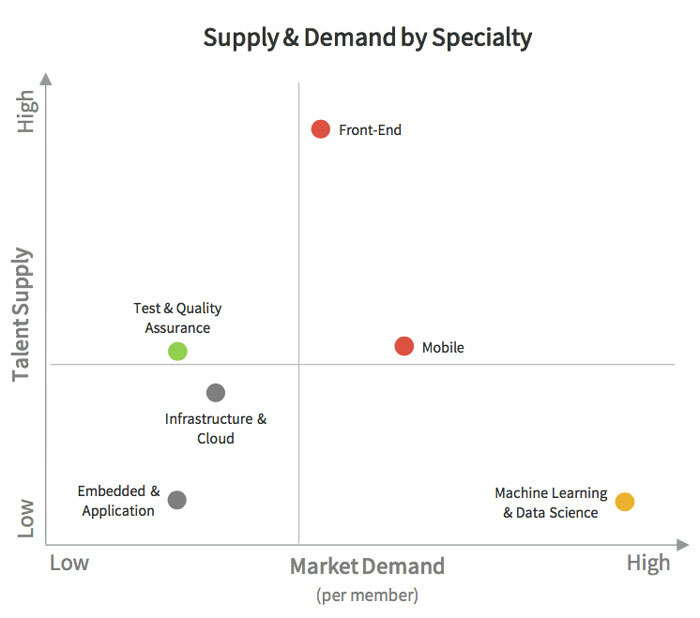 Engineers specializing in machine learning & data science top the overall group when it comes to market demand albeit their talent pool is the smallest. They are followed by those who work in mobile and front-end development, two of the specialties with larger talent pools. And if you need to hire test and quality assurance talent, you’ll likely have an easier time relative to other specialties. 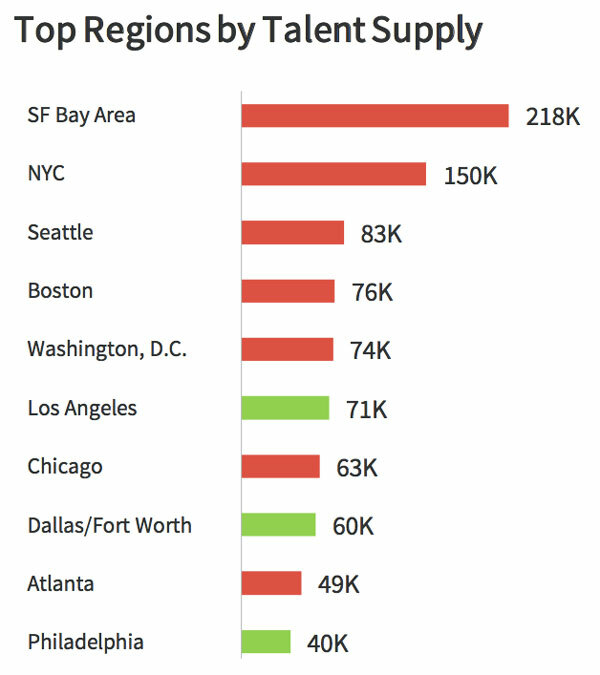 As perhaps expected, the San Francisco Bay Area boasts both the largest supply of and highest demand for software engineers in the United States. The top five markets for engineering supply—including the Bay Area and other large, coastal cities—account for more than 33% of the total talent pool. In the chart above, cities where talent is in very high demand are represented by red bars. On the other hand, the cities represented by green bars—Los Angeles, Dallas/Fort Worth and Philadelphia—are all top-10 markets in terms of volume but feature relatively low demand. 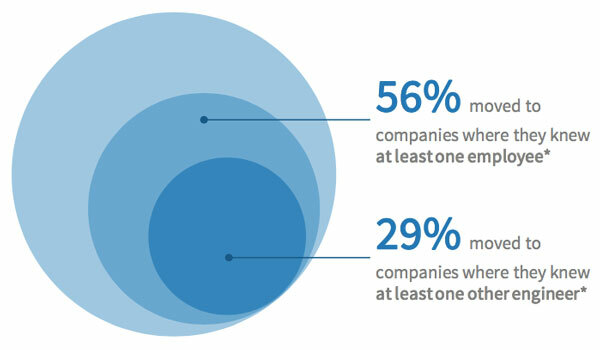 Consider targeting engineers in these “hidden gem” markets, as they might be more receptive to your proactive outreach. 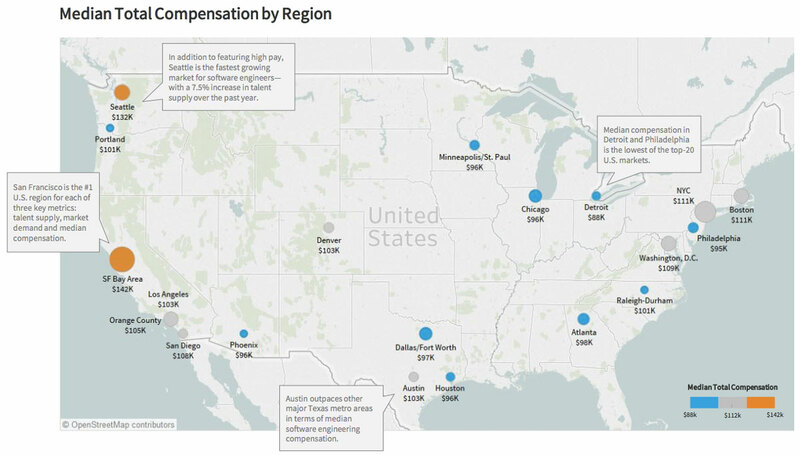 As competition for engineering talent is fiercest in San Francisco and Seattle, it’s no surprise that engineers there are compensated accordingly. In general, compensation and demand tend to vary together, with the highest-demand markets for engineering talent also being the cities where engineers get paid the most. San Francisco, for example, is the #1 U.S. city both in terms of engineering talent supply and engineering compensation. In addition to featuring higher pay than the majority of the U.S., Seattle is the fastest growing market for software engineers, with a 7.5% increase in talent supply over the past year. In contrast, median compensation in Detroit and Philadelphia is the lowest of the top-20 U.S. markets by talent supply. The correlation between demand and compensation carries at the specialty level as well. Machine learning and data science engineers, who are highly concentrated in San Francisco and Seattle, make the most money on average—with those specializing in embedded & application, infrastructure & cloud and mobile development following close behind. 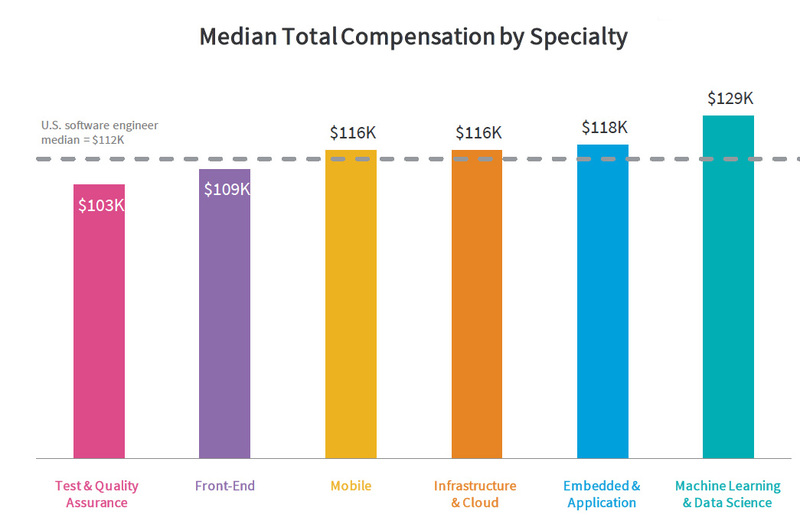 Predictably, compensation increases as years of experience increase—and the biggest jump in market value happens between a software engineer’s entry into the workforce and the five-year mark. Generally, engineers make a lot more money when they change jobs, and those jumps in compensation are more pronounced than for other occupations. According to a LinkedIn survey of members that switched jobs, 77% of engineers say they received a 10% raise or higher upon changing roles—which is true of just 57% of the general population. According to LinkedIn survey data, engineers say they apply to jobs less frequently than the average professional. Instead, they are more likely to engage in activities associated with a less active kind of job search: keeping their professional profile up-to-date, learning new skills, and responding to recruiters when contacted directly (with a relevant highly-tailored InMail). What’s more, engineers engage frequently with prospective employers. In fact, 72% of software engineers follow at least one company where they’ve never worked—and those that do this follow an average of 9 companies on LinkedIn. This suggests significant interest in learning more about what it’s like to work at other organizations. A grand total of more than 432k engineers changed jobs in the past two years, including regional, sector, and role-level moves. Engineers focused on machine learning & data science, who we learned earlier garner the most demand from the market, also relocate and change sectors most frequently. 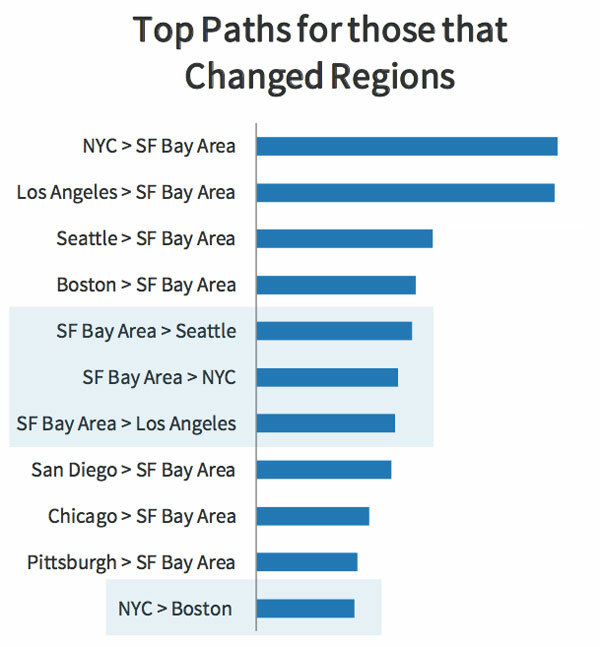 While the San Francisco Bay Area is the clear leader in terms of engineering relocation, Seattle, NYC, L.A. and Boston have also emerged as major destinations for engineering talent in the United States. And though most paths that involve a change in industry lead to software companies, firms in other sectors are pulling some talent away from Tech. 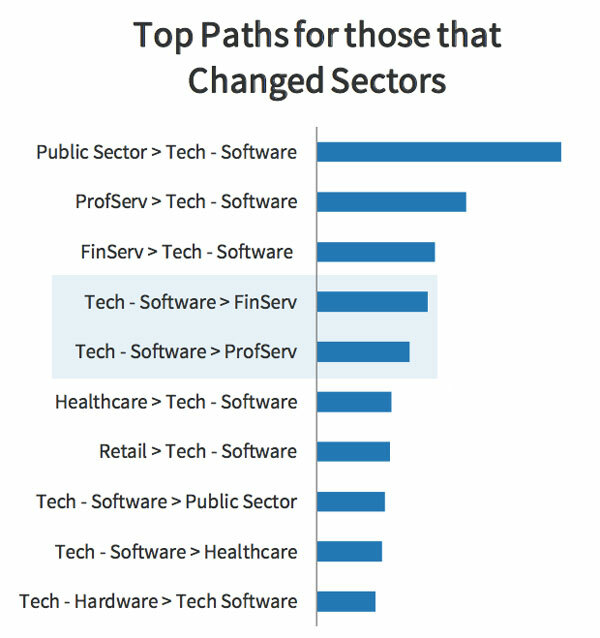 In particular, movement from the Tech sector to Financial Services and to Professional Services were the fourth and fifth most frequently occurring paths, respectively, and movement to the Public Sector and Healthcare also made the top 10 list. So what’s causing engineers to move? The proverbial “it’s who you know” might hold the answer. Connectedness often plays a role in the decision-making process about whether to join a company—and engineering talent is no exception in that regard. U.S. engineers are a highly inter-networked group, with the median software engineer being connected to 21 other software engineers. *Connected at least 30 days before their start date with the company. And more than half of the engineering population that changed jobs moved to a new company where they already knew at least one person. In fact, the median software engineer was connected to 2 employees—including one software engineer—at their new company prior to joining.